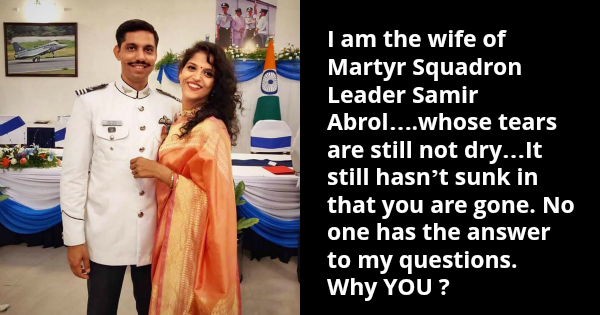 I am Garima Abrol…..I am the wife of Martyr Squadron Leader Samir Abrol….whose tears are still not dry…It still hasn’t sunk in that you are gone. No one has the answer to my questions. Why YOU ? My husband was a proud Indian and I loved sending him off to serve the nation with a morning cup of tea and a head held high. Every soldier’s wife’s biggest fear in life is when her husband would be called to the front line and serve in an active war. I too had this fear. Many a times I woke up crying after having one such bad dream…But Samir would hold me, console me and tell me…that is the ultimate purpose of his job…to be able to serve our nation when the call comes…He wanted me to be brave, as that’s what he was, a brave soldier, patriot to the core.